Advertise Where People's Eyes Are! Get Your Ad Seen On Android & iPhones All Around You! No one reads the Newspaper these days. People don't watch cable, they watch Netflix and Hulu! Radio ads are never heard anymore. Banners and Billboards are too expensive! At Genusity, We Have The Solution! Let's face it, advertising is only effective when people's eyeballs are on your ad! "The last time you were at the mall, or in a Starbucks, how many people were looking at their phone?" Your ads will not only be transmitted from your Beacons, which is your first type of advertising, but you will also be apart of the Genusity Advertising Network (GAN) at NO ADDITIONAL CHARGE! 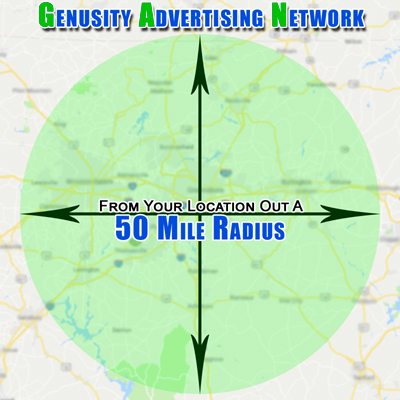 Our Radius Targeted Online Advertising will allow your ads to be seen within a 50 mile radius of the beacon and/or your zip code. This will make your Beacons the most powerful advertising device you can have! What does all of this mean? We can now GUARANTEE you VIEWS of your ads. It also means that your ads will now be seen on all devices! So not only will you be advertising to those around your Beacons, but you will now be advertising online to everyone within a 50 mile radius of your Beacon or entered zip/postal code. You can enter any Zip or Postal Code in the world into the system and have your 50 Mile Radius Targeted Online Advertising working for you in that area. So if you live in Asheville, NC and want to advertise in New York City, just enter a Zip Code for NY City and your Ads will be seen on up to 6000 websites online within a 50 mile radius of that Zip Code. Want to advertise in England? Enter in a Postal code for an area in England and now you have Ads showing on up to 6000 websites in England. The best part is, you can change the Zip/Postal Code as often as you like! Have your Ad seen on websites such as Social Media, News Media, Games, Blogs, Search Sites, E-Mail Sites, Video Sites and more. This BB is best used for sales people, Real Estate Agents, Insurance Agents, Delivery Drivers, etc. 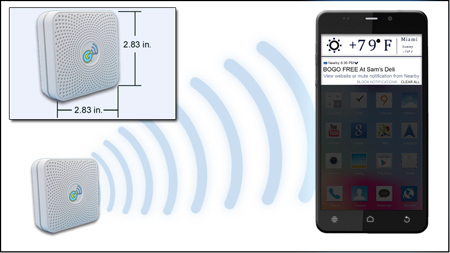 Use the BB to transmit your Ad to every Bluetooth enabled* cell phone up to a 150 foot radius of you. 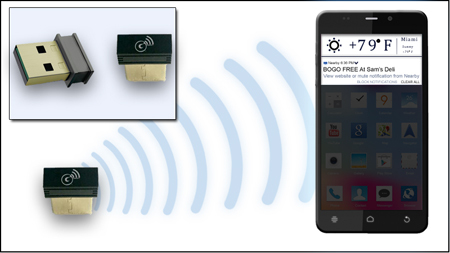 Genusity BB is a fully standalone Bluetooth proximity beacon, implemented in a lightweight package that is powered by a user-replaceable CR2032 coin-cell battery. It’s the perfect beacon for conferences, trade shows, exhibits and other events where power may not be readily available and ultimate flexibility in placement is most important. It can be flexibly installed in any location, regardless of available power. This BB SPORT is best used for people on the go that need to get their advertising out to the public. Use the BB SPORT to transmit your Ad to every Bluetooth enabled* cell phone up to a 150 foot radius of you. 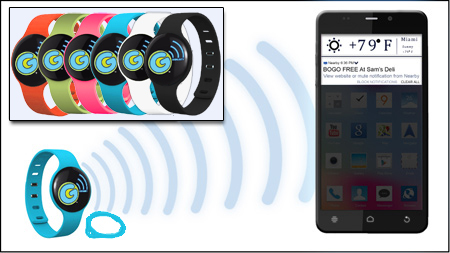 Genusity BB SPORT is an all-weather, long-life proximity beacon. Ruggedized and water resistant enclosure making it capable of withstanding most temperature and weather conditions. The Genusity BB SPORT is implemented in a lightweight package that is powered by a rechargeable battery. It comes complete with the Unit, Wristband, keychain holder and USB charging cable. This BAP is best used for Retail Stores, Restaurants, Businesses, Stadiums, etc. 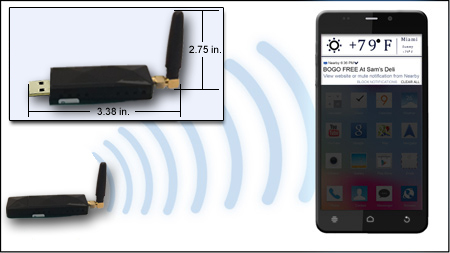 Use the BAP to transmit your Ad to every Bluetooth enabled* cell phone up to a 300 foot radius of you. Genusity BAP is an all-weather, long-life proximity beacon. Ruggedized and weatherproof enclosure making it capable of withstanding the most extreme temperature and weather conditions. The Genusity BAP gets maximum battery life from a button cell battery and can be flexibly installed in any location, regardless of available power. That makes the Genusity BAP the perfect unit for outdoor installations, industrial environments and anyplace where high uptime and long battery life is an absolute requirement. This BOOM is best used for Retail Stores, Restaurants, Businesses, Stadiums, etc. 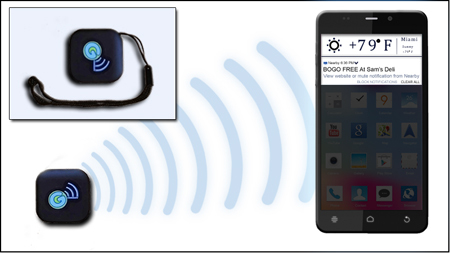 Use the BOOM to transmit your Ad to every Bluetooth enabled* cell phone up to a 250 foot radius of you. Genusity BOOM USB is a fully standalone beacon. Genusity BOOM USB is powered from any standard USB port. You can use any USB AC adaptor, car adaptor, or computer with a spare USB port. This BLAST 1.0 is best used for Retail Stores, Restaurants, Businesses, Stadiums, etc. Use the BLAST 1.0 to transmit your Ad to every Bluetooth enabled* cell phone up to a 984 foot radius of you. The Genusity BLAST 1.0 has a fully rugged and water resistant enclosure. The Genusity BLAST 1.0 is perfect for installations where you need distance. 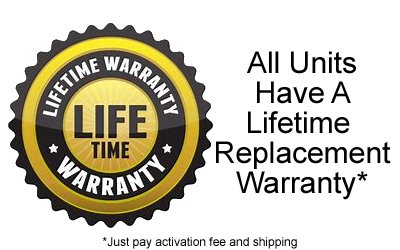 It has a long battery life (up to 5 years) that is an absolute requirement. The battery is completely replaceable as well, making this the perfect beacon for anyone. This BLAST 3.0 is best used for Retail Stores, Restaurants, Businesses, Stadiums, etc. 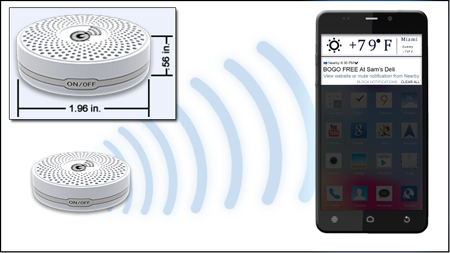 Use the BLAST 3.0 to transmit your Ad to every Bluetooth enabled* cell phone up to a 1640 foot radius of you. The BLAST 3.0 is a fully standalone beacon. It is powered from any standard USB port making it usable in any USB AC adaptor, car adaptor, or computer with a spare USB port. The Genusity BLAST 3.0 is perfect for installations where you need distance. Real Estate Agents place these in your show homes so drive by's get more information. Insurance Agents give everyone in your client's neighborhood your virtual business card! Place this in your window to transmit menu specials and discounts to passerby's. Give them to your delivery drivers so everywhere they go, people are getting your coupons. Carry this with you and give everyone your virtual business card while never having to speak with them. Make money and sell these to other people and businesses. These are just a few ideas for the Genusity Units. But really, you can use them for anything. If you want or need to get your message out there, Genusity Units are for you! We are an internationally recognized company that specializes in helping businesses develop new customer bases through implemented advertising technologies at the lowest prices possible. Genusity... What Smart Businesses Use!